Wearing this intelligent jacket at South by Southwest made me believe in the potential of connected clothes. When Google announced plans to make smart clothing back in 2015 with Project Jacquard, I was intrigued but skeptical. I’ve worn sensor-filled clothes before, and they end up being more gimmicky than practical. But after trying on the first Jacquard product, a denim Levi’s jacket, I’m a believer. My biggest issue with wearable technology is that devices tend to be focused more on technology than wearability. But the Jacquard jacket is a piece of tech you’ll actually want to wear. I own and wear a Levi’s jacket on the regular, and the Jacquard version—a dark wash commuter style—is just as easy to throw on as you’re walking out the door. It’s as stylish and classic as any Levi’s item, which is Americana at its finest. In other words: It doesn’t scream, “Ask me about my technology!” like a smartwatch does. But this jacket has all the functionality of a smartwatch built in. You can brush your cuff to hear an ETA to your destination, brush the other direction to skip a song, and double tap to play or pause your music. Here’s how it works: A rechargeable Bluetooth tag snaps into the cuff so you can pair the jacket to the Jacquard app. It’s not just Bluetooth that gives the denim intelligence. 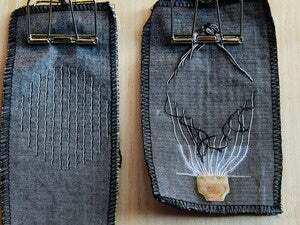 As part of the Jacquard project, Google designed conductive thread that can be woven into any textile. It started with a Levi’s collaboration because denim is some of the toughest cloth out there. The conductive thread on the jacket is woven into the cuff, next to the Bluetooth tag, and you swipe on the cuff like you would a smartwatch screen. There are three gestures: brushing toward you, brushing away from you, and double-tapping. You can assign each of those gestures functionality in the Jacquard app, and swap them out whenever you’d like. The cuff was indeed responsive, and surprisingly sensitive to pressure, which you can watch in real-time in a part of the app called Touch. Then there are the little details built into the jacket itself, like wind-resistant sleeve lining for bicyclists (so bugs and debris don’t fly up your arms, as they are wont to do) and side snaps for ease when you sit down. All of this comes at a price that’s much higher than a typical Levi’s jacket. Google announced at SXSW that its Levi’s collaboration will cost around $350 when it goes on sale this fall online and in select Levi’s stores. I slipped on the jacket at the SXSW Levi’s Outpost, and as I admired its look in the full-length mirror, I realized: By marrying fashion and technology in a way that makes sense for how real people live, Google hasn’t just breathed new life into a stale tech category. I think the company has officially redeemed itself for Google Glass.